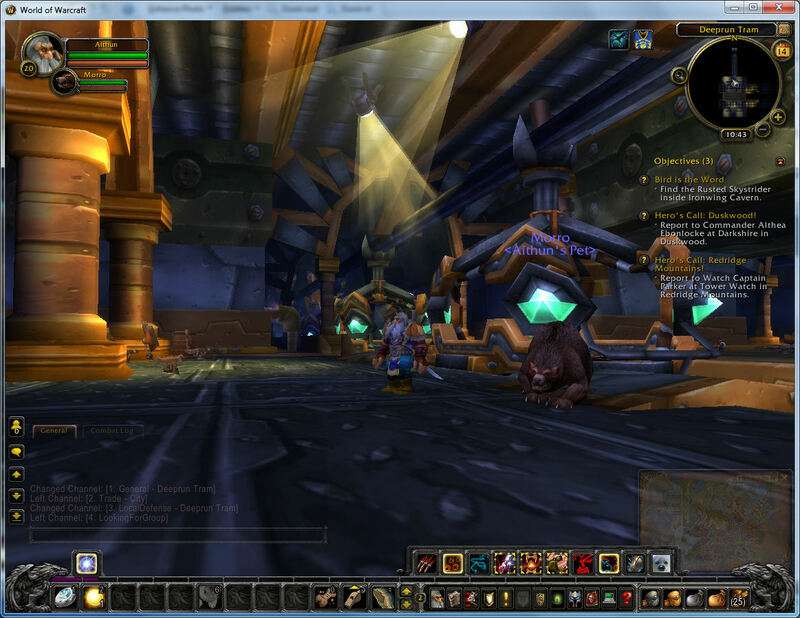 I have been exploring the Deeprun Tram that connects Stormwind City and and dwarf home city of Ironforge. The introduction to this facility was shown to me during a party gathering of IDGBL players, and shows the value of sharing and communicating with others in such games. It opened up a lot of new route possibilties and modes of transport. I also used a magic portal, generated by a mage in the party, for the first time to go to a city. One interesting aspect was the when we reached Ironforge, as it was my dwarf race home city, the other members of the party expected me to know my way about and help gather the party up at a location where a gryphon flight master was located. I had not fully explored my home area when first entering World of Warcraft as I had been more concerend to ensure I could reach the human race entry point of Northshire Abbey to join the IDGBL party for joint quests. However, I have rectified that now, and it was interesting exploring some of the areas in Ironforge created by the dwarf race in ancient times. This entry was posted in World of Warcraft and tagged World of Warcraft. Bookmark the permalink.